Speed, uppers, chalk, glass, crystal, or whatever you prefer to call them, can be instantly detected from biological fluids with a new portable kit that costs as little as $50. 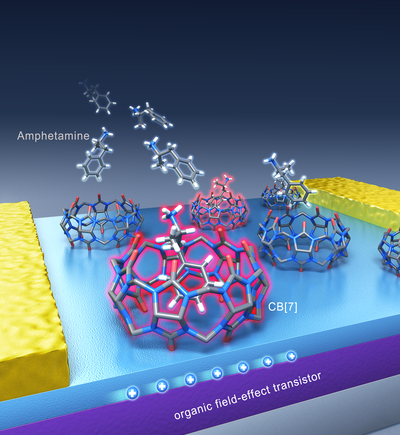 Scientists at the Center for Self-Assembly and Complexity, within the Institute for Basic Science (IBS, South Korea), in collaboration with Pohang University of Science and Technology (POSTECH), have devised the first methamphetamine and amphetamine sensor that can detect minute concentrations of these drugs from a single drop of urine in real-time. Published in the journal Chem (“Point-of-Use Detection of Amphetamine-Type Stimulants with Host-Molecule-Functionalized Organic Transistors”), this simple and flexible sensor, which can be attached to a wristband and connected to an Android app via Bluetooth, could move drug screening from the labs to the streets. Easy to synthesize and cheaper than heroin or cocaine, amphetamine-based drugs are the most abused drugs in the world, after cannabis. Conventional drug detection methods require a long time, as the sample must be taken into a lab for the analysis. It also needs experts to run the expensive equipment. The technology reported in this study is instead small, portable, cheap, fast and easy to use. 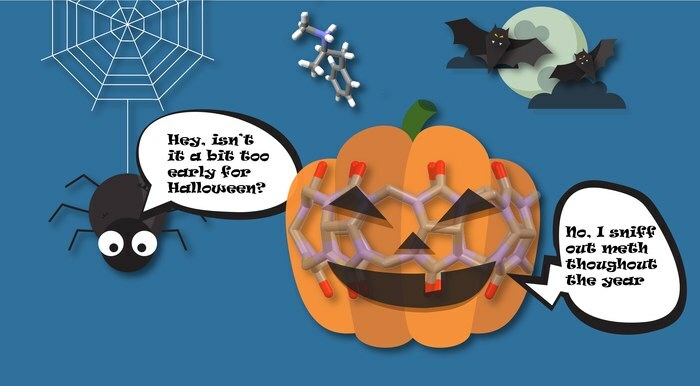 The idea for this technology came from the IBS chemist HWANG Ilha: “I was watching a TV news report on the usage of illegal drugs, and I thought to check what the chemical structure of methamphetamine looks like.” Soon after, the scientist anticipated that the drug would form a tight complex with a family of hollow pumpkin-shaped molecules, called cucurbituril (CB) members. The team then discovered that cucurbituril (CB)’s empty cavity binds well with amphetamine-based drugs and can be used as the drug recognition unit of a sensor. Cucurbiturils’ hollow chamber has already been studied for various technological uses, but this is the first device application in amphetamine-based drug detection. ▲ Figure 1: Wireless sensor for amphetamine-based drug detection.The kit is made of an organic field-effect transistor (OFET) device, an electric circuit board with a rechargeable battery and an antenna. The OFET device surface is coated with CB, whose function is to bind amphetamine and methamphetamine drugs in solution. The binding event is instantly converted to current, whose magnitude is proportional to the concentration of the drug. The app on the smartphone shows a peak as soon as a drop of urine with the drug is applied to the device. Moreover the entire kit can fit in a handy wristband. 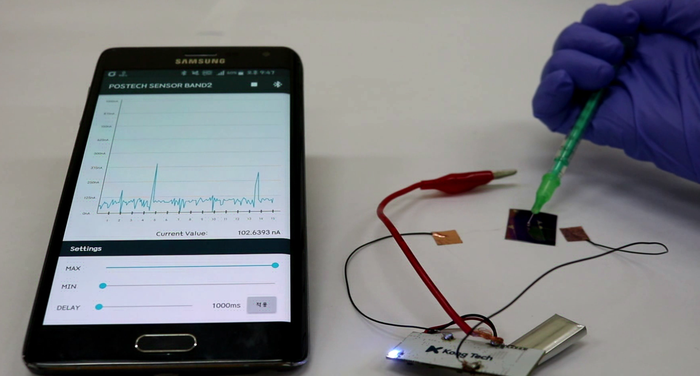 Combining a transistor coated with CB, flexible materials, rechargeable batteries and a Bluetooth antenna, the research team developed a detector wristband connected to an app. In the presence of the drug, the molecular recognition between CB and the drug molecule triggers an electrical signal which appears as a peak on the smartphone screen. Current drug detection based on immunoassay or liquid chromatography/mass spectrometry techniques has a detection limit of about 10 ng/mL. On the contrary, the sensitivity of this new sensor is about 0.0001 ng/mL in water and 0.1 ng/mL in urine. Therefore, it is expected that this method will allow the detection of drug molecules in biological fluids, like urine and sweat, for a longer time after drug consumption. ▲ Figure 2: Graphic representation of the drug detection platform.Binding of drug molecules to the hollow cucurbituril (CB)’s cavity changes the current signal flowing in the transistor and therefore can be used as a detection system. The molecular structure of amphetamine and methamphetamine bound to cucurbituril (CB) was confirmed with X-ray crystallography. Each color indicates a different atom (blue: nitrogen, red: oxygen, gray: carbon, and white: hydrogen). CB’s hydrogen atoms have been omitted for clarity. “Combining basic science with the latest technology, we can expect that this research will also lead to other new sensors, useful for our daily life,” concludes the third corresponding author OH Joon Hak. Indeed, the team is also keen on developing sensors for other kinds of drugs, as well as kits for the detection of dangerous substances, environmental monitoring, healthcare and safety. This paper appears to be behind a paywall. This entry was posted in nanotechnology and tagged amphetamine-based drugs, Bluetooth antenna, chalk, crystal, cucurbituril (CB) members, Eunyeong Jin, glass, handheld sensors, hollow pumpkin-shaped molecules, Hwang Ilha, Hyoeun Kim, Ilha Hwang., In-Chul Hwang, Institute for Basic Science (IBS), Jin Young Koo, Joon Hak Oh, Kim Kimoon, Kimoon Kim, Korea, Letizia Diamante, methamphetamine and amphetamine sensor, Moonjeong Jang, Pohang University of Science and Technology (POSTECH), point-of-detection sensors, Point-of-Use Detection of Amphetamine-Type Stimulants with Host-Molecule-Functionalized Organic Transistors, Sang Jin Lee, South Korea, Speed, uppers, urine, Yonghwi Kim, Yoonjung Jang, Young Ho Ko on December 13, 2017 by Maryse de la Giroday. The International Thermonuclear Experimental Reactor (ITER), a project to prove that fusion power can be produced on a commercial scale and is sustainable, is now 50 percent built to initial operation. Fusion is the same energy source from the Sun that gives the Earth its light and warmth. * Fusion energy is carbon-free and environmentally sustainable, yet much more powerful than fossil fuels. A pineapple-sized amount of hydrogen offers as much fusion energy as 10,000 tons of coal. * ITER uses two forms of hydrogen fuel: deuterium, which is easily extracted from seawater; and tritium, which is bred from lithium inside the fusion reactor. The supply of fusion fuel for industry and megacities is abundant, enough for millions of years. * When the fusion reaction is disrupted, the reactor simply shuts down-safely and without external assistance. Tiny amounts of fuel are used, about 2-3 grams at a time; so there is no physical possibility of a meltdown accident. fusion will not have the environmental cost of releasing CO2 and other pollutants. ITER is the most complex science project in human history. The hydrogen plasma will be heated to 150 million degrees Celsius, ten times hotter than the core of the Sun, to enable the fusion reaction. The process happens in a donut-shaped reactor, called a tokamak(*), which is surrounded by giant magnets that confine and circulate the superheated, ionized plasma, away from the metal walls. The superconducting magnets must be cooled to minus 269°C, as cold as interstellar space. The ITER facility is being built in Southern France by a scientific partnership of 35 countries. ITER’s specialized components, roughly 10 million parts in total, are being manufactured in industrial facilities all over the world. They are subsequently shipped to the ITER worksite, where they must be assembled, piece-by-piece, into the final machine. Each of the seven ITER members-the European Union, China, India, Japan, Korea, Russia, and the United States-is fabricating a significant portion of the machine. This adds to ITER’s complexity. In a message dispatched on December 1  to top-level officials in ITER member governments, the ITER project reported that it had completed 50 percent of the “total construction work scope through First Plasma” (**). First Plasma, scheduled for December 2025, will be the first stage of operation for ITER as a functional machine. “The stakes are very high for ITER,” writes Bernard Bigot, Ph.D., Director-General of ITER. “When we prove that fusion is a viable energy source, it will eventually replace burning fossil fuels, which are non-renewable and non-sustainable. Fusion will be complementary with wind, solar, and other renewable energies. “ITER’s success has demanded extraordinary project management, systems engineering, and almost perfect integration of our work. The ITER 50 percent milestone is getting significant attention. “We are fortunate that ITER and fusion has had the support of world leaders, historically and currently,” says Director-General Bigot. “The concept of the ITER project was conceived at the 1985 Geneva Summit between Ronald Reagan and Mikhail Gorbachev. When the ITER Agreement was signed in 2006, it was strongly supported by leaders such as French President Jacques Chirac, U.S. President George W. Bush, and Indian Prime Minister Manmohan Singh. “More recently, President Macron and U.S. President Donald Trump exchanged letters about ITER after their meeting this past July. One month earlier, President Xi Jinping of China hosted Russian President Vladimir Putin and other world leaders in a showcase featuring ITER and fusion power at the World EXPO in Astana, Kazakhstan. Why use this complex manufacturing arrangement? More than 80 percent of the cost of ITER, about $22 billion or EUR18 billion, is contributed in the form of components manufactured by the partners. Many of these massive components of the ITER machine must be precisely fitted-for example, 17-meter-high magnets with less than a millimeter of tolerance. Each component must be ready on time to fit into the Master Schedule for machine assembly. Members asked for this deal for three reasons. First, it means that most of the ITER costs paid by any member are actually paid to that member’s companies; the funding stays in-country. Second, the companies working on ITER build new industrial expertise in major fields-such as electromagnetics, cryogenics, robotics, and materials science. Third, this new expertise leads to innovation and spin-offs in other fields. For example, expertise gained working on ITER’s superconducting magnets is now being used to map the human brain more precisely than ever before. The European Union is paying 45 percent of the cost; China, India, Japan, Korea, Russia, and the United States each contribute 9 percent equally. All members share in ITER’s technology; they receive equal access to the intellectual property and innovation that comes from building ITER. When will commercial fusion plants be ready? ITER scientists predict that fusion plants will start to come on line as soon as 2040. The exact timing, according to fusion experts, will depend on the level of public urgency and political will that translates to financial investment. How much power will they provide? The ITER tokamak will produce 500 megawatts of thermal power. This size is suitable for studying a “burning” or largely self-heating plasma, a state of matter that has never been produced in a controlled environment on Earth. In a burning plasma, most of the plasma heating comes from the fusion reaction itself. Studying the fusion science and technology at ITER’s scale will enable optimization of the plants that follow. A commercial fusion plant will be designed with a slightly larger plasma chamber, for 10-15 times more electrical power. A 2,000-megawatt fusion electricity plant, for example, would supply 2 million homes. How much would a fusion plant cost and how many will be needed? The initial capital cost of a 2,000-megawatt fusion plant will be in the range of $10 billion. These capital costs will be offset by extremely low operating costs, negligible fuel costs, and infrequent component replacement costs over the 60-year-plus life of the plant. Capital costs will decrease with large-scale deployment of fusion plants. At current electricity usage rates, one fusion plant would be more than enough to power a city the size of Washington, D.C. The entire D.C. metropolitan area could be powered with four fusion plants, with zero carbon emissions. * “Tokamak” is a word of Russian origin meaning a toroidal or donut-shaped magnetic chamber. Tokamaks have been built and operated for the past six decades. They are today’s most advanced fusion device design. ** “Total construction work scope,” as used in ITER’s project performance metrics, includes design, component manufacturing, building construction, shipping and delivery, assembly, and installation. At a dusty construction site here amid the limestone ridges of Provence, workers scurry around immense slabs of concrete arranged in a ring like a modern-day Stonehenge. It looks like the beginnings of a large commercial power plant, but it is not. The project, called ITER, is an enormous, and enormously complex and costly, physics experiment. But if it succeeds, it could determine the power plants of the future and make an invaluable contribution to reducing planet-warming emissions. ITER, short for International Thermonuclear Experimental Reactor (and pronounced EAT-er), is being built to test a long-held dream: that nuclear fusion, the atomic reaction that takes place in the sun and in hydrogen bombs, can be controlled to generate power. ITER will produce heat, not electricity. But if it works — if it produces more energy than it consumes, which smaller fusion experiments so far have not been able to do — it could lead to plants that generate electricity without the climate-affecting carbon emissions of fossil-fuel plants or most of the hazards of existing nuclear reactors that split atoms rather than join them. Success, however, has always seemed just a few decades away for ITER. The project has progressed in fits and starts for years, plagued by design and management problems that have led to long delays and ballooning costs. ITER is moving ahead now, with a director-general, Bernard Bigot, who took over two years ago after an independent analysis that was highly critical of the project. Dr. Bigot, who previously ran France’s atomic energy agency, has earned high marks for resolving management problems and developing a realistic schedule based more on physics and engineering and less on politics. The site here is now studded with tower cranes as crews work on the concrete structures that will support and surround the heart of the experiment, a doughnut-shaped chamber called a tokamak. This is where the fusion reactions will take place, within a plasma, a roiling cloud of ionized atoms so hot that it can be contained only by extremely strong magnetic fields. It seems the folks at the New York Times decided to remove the notes which help make sense of this image. However, it does get the idea across. If I read the article rightly, the official cost in March 2017 was around 22 B Euros and more will likely be needed. You can read Fountain’s article for more information about fusion and ITER or go to the ITER website. A new documentary featuring General Fusion has captured the exciting progress in fusion across the public and private sectors. Let There Be Light made its international premiere at the South By Southwest (SXSW) music and film festival in March  to critical acclaim. The film was quickly purchased by Amazon Video, where it will be available for more than 70 million users to stream. Let There Be Light follows scientists at General Fusion, ITER and Lawrenceville Plasma Physics in their pursuit of a clean, safe and abundant source of energy to power the world. The feature length documentary has screened internationally across Europe and North America. Most recently it was shown at the Hot Docs film festival in Toronto, where General Fusion founder and Chief Scientist Dr. Michel Laberge joined fellow fusion physicist Dr. Mark Henderson from ITER at a series of Q&A panels with the filmmakers. Laberge and Henderson were also interviewed by the popular CBC radio science show Quirks and Quarks, discussing different approaches to fusion, its potential benefits, and the challenges it faces. It is yet to be confirmed when the film will be release for streaming, check Amazon Video for details. You can find out more about General Fusion here. ITER is a breathtaking effort but if you’ve read about other large scale projects such as building a railway across the Canadian Rocky Mountains, establishing telecommunications in an astonishing number of countries around the world, getting someone to the moon, eliminating small pox, building the pyramids, etc., it seems standard operating procedure both for the successes I’ve described and for the failures we’ve forgotten. Where ITER will finally rest on the continuum between success and failure is yet to be determined but the problems experienced so far are not necessarily a predictor. I wish the engineers, scientists, visionaries, and others great success with finding better ways to produce energy. This entry was posted in energy and tagged Bernard Bigot, Canada, China, commercial fusion plants, cryogenics, Donald Trump, electromagnetics, European Union, France, fusion power, fusion science, General Fusion, George W. Bush, heat energy, Henry Fountain, hydrogen fusion, India, International Thermonuclear Experimental Reactor (ITER), ITER tokamak, Japan, Korea, Lawrenceville Plasma Physics, Let There Be Light (documentary), Manmohan Singh. Emanuel Macron, Mark Henderson, materials science, Michel Laberge, Mikhail Gorbachev. Jacques Chirac, plasma heating, robotics, Ronald Reagan, Russia, South By Southwest (SXSW), superconducting magnets, tokamak, US, Vladimir Putin, Xi Jinping on December 6, 2017 by Maryse de la Giroday. The edible coating on produce has drawn a great deal of attention in the food and agricultural industry. It could not only prolong postharvest shelf life of produce against external changes in the environment but also provide additional nutrients to be useful for human health. However, most versions of the coating have had intrinsic limitations in their practical application. First, highly specific interactions between coating materials and target surfaces are required for a stable and durable coating. Even further, the coating of bulk substrates, such as fruits, is time consuming or is not achievable in the conventional solution-based coating. In this respect, material-independent and rapid coating strategies are highly demanded. The research team led by Professor Insung Choi of the Department of Chemistry developed a sprayable nanocoating technique using plant-derived polyphenol that can be applied to any surface. Polyphenols, a metabolite of photosynthesis, possess several hydroxyl groups and are found in a large number of plants showing excellent antioxidant properties. They have been widely used as a nontoxic food additive and are known to exhibit antibacterial, as well as potential anti-carcinogenic capabilities. Polyphenols can also be used with iron ions, which are naturally found in the body, to form an adhesive complex, which has been used in leather tanning, ink, etc. The research team combined these chemical properties of polyphenol-iron complexes with spray techniques to develop their nanocoating technology. Compared to conventional immersion coating methods, which dip substrates in specialized coating solutions, this spray technique can coat the select areas more quickly. The spray also prevents cross contamination, which is a big concern for immersion methods. The research team has showcased the spray’s ability to coat a variety of different materials, including metals, plastics, glass, as well as textile fabrics. The polyphenol complex has been used to form antifogging films on corrective lenses, as well as antifungal treatments for shoe soles, demonstrating the versatility of their technique. Furthermore, the spray has been used to coat produce with a naturally antibacterial, edible film. 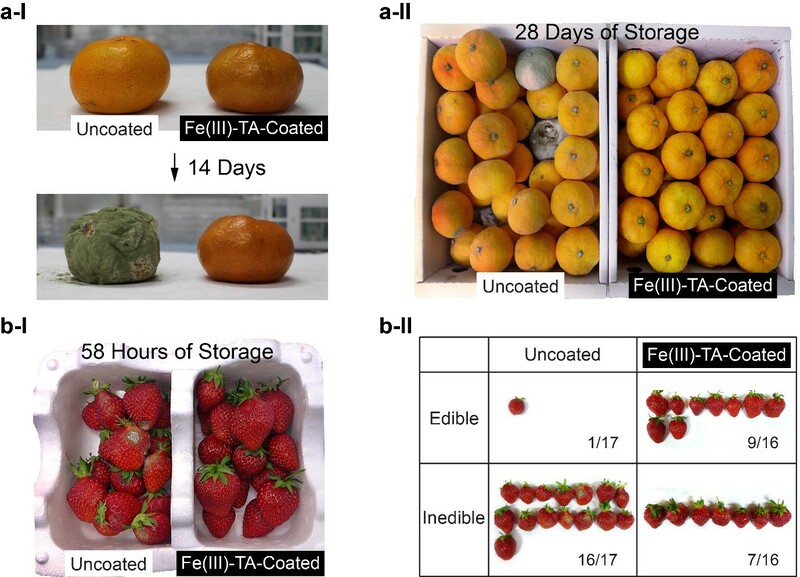 The coatings significantly improved the shelf life of tangerines and strawberries, preserving freshness beyond 28 days and 58 hours, respectively. (Uncoated fruit decomposed and became moldy under the same conditions). See the image below. b –II: Statistical investigation of the resulting edibility. *’life’ added to correct headline on Sept. 4, 2017. This entry was posted in agriculture, clothing, coatings, food, nanotechnology and tagged adhesive complex, anti-carcinogenic capabilities, antibacterial properties, antifogging films on corrective lenses, antifungal treatments for shoe soles, Antimicrobial spray nanocoating of supramolecular Fe(III)-tannic acid metal-organic coordination complex: applications to shoe insoles and fruits, antioxidant properties, Bong Lee, Dong Ryu, edible coating, Eunhye Kang, food industry, Hee Moon, Hyelin Seo, Insung Choi, Insung S. Choi, Ji Kim, Ji Park, Jinho Lee, KAIST, Korea, Korea Advanced Institute of Science and Technology (KAIST), nontoxic food additive, plant-derived polyphenol, produce, Seok-Pyo Hong, Sohee Choi, South Korea on September 1, 2017 by Maryse de la Giroday. During sepsis, cells are swamped with reactive oxygen species generated in an aberrant response of the immune system to a local infection. If this fatal inflammatory path could be interfered, new treatment schemes could be developed. Now, Korean scientists report in the journal Angewandte Chemie that zirconia-doped ceria nanoparticles act as effective scavengers of these oxygen radicals, promoting a greatly enhanced surviving rate in sepsis model organisms. Sepsis proceeds as a vicious cycle of inflammatory reactions of the immune system to a local infection. Fatal consequences can be falling blood pressure and the collapse of organ function. As resistance against antibiotics is growing, scientists turn to the inflammatory pathway as an alternative target for new treatment strategies. Taeghwan Heyon from Seoul National University, Seung-Hoon Lee at Seoul National University Hospital, South Korea, and collaborators explore ceria nanoparticles for their ability to scavenge reactive oxygen species, which play a key role in the inflammatory process. By quickly converting between two oxidation states, the cerium ion can quench typical oxygen radical species like the superoxide anion, the hydroxyl radical anion, or even hydrogen peroxide. But in the living cell, this can only happen if two conditions are met. The first condition is the size and nature of the particles. Small, two-nanometer-sized particles were coated by a hydrophilic shell of poly(ethylene glycol)-connected phospholipids to make them soluble so that they can enter the cell and remain there. Second, the cerium ion responsible for the quenching (Ce3+) should be accessible on the surface of the nanoparticles, and it must be regenerated after the reactions. Here, the scientists found out that a certain amount of zirconium ions in the structure helped, because “the Zr4+ ions control the Ce3+-to-Ce4+ ratio as well as the rate of conversion between the two oxidation states,” they argued. The prepared nanoparticles were then tested for their ability to detoxify reactive oxygen species, not only in the test tube, but also in live animal models. The results were clear, as the authors stated: “A single dose of ceria-zirconia nanoparticles successfully attenuated the vicious cycle of inflammatory responses in two sepsis models.” The nanoparticles accumulated in organs where severe immune responses occurred, and they were successful in the eradication of reactive oxygen species, as evidenced with fluorescence microscopy and several other techniques. And importantly, the treated mice and rats had a far higher survival rate. This work demonstrates that other approaches in sepsis treatment than killing bacteria with antibiotics are possible. Targeting the inflammatory signal pathways in macrophages is a very promising option, and the authors have shown that effective scavenging of reactive oxygen species and stopping inflammation is possible with a suitably designed chemical system like this cerium ion redox system provided by nanoparticles. This entry was posted in medicine, nanotechnology and tagged antioxidant, ceria nanoparticles, Ceria–Zirconia Nanoparticles as an Enhanced Multi-Antioxidant for Sepsis Treatment, Changyeong Song, Chi Kyung Kim, Do Yeon Kim, Dokyoon Kim, Dong-Wan Kang, fatal inflammatory path, Han-Gil Jeong, Hyek Jin Kwon, In-Young Choi, infection, Korea, Min Soh, Prof. Seung-Hoon Lee, Seoul National University, Seoul National University Hospital, sepsis, Seul-Ki Ki, Seungmin Baik, South Korea, Taeghwan Hyeon, Taeho Kim, Wookjin Yang on August 9, 2017 by Maryse de la Giroday. A group of scientists from the Faculty of Chemistry under the leadership of Prof. Alexander Kabanov has focused their research supported by a “megagrant” on the nanoparticle-based delivery to an organism of enzymes, capable of destroying toxic organophosphorous compounds. Development of first nanosized drugs has started more than 30 years ago and already in the 90-s first nanomedicines for cancer treatment entered the market. First such medicines were based on liposomes – spherical vesicles made of lipid bilayers. The new technology, developed by Kabanov and his colleagues, uses an enzyme, synthesized at the Lomonosov Moscow State University, encapsulated into a biodegradable polymer coat, based on an amino acid (glutamic acid). Professor Kabanov’s team after moving to the USA in 1994 focused on development of polymer micelles, which could include biopolymers due to electrostatic interactions. Initially chemists were interested in usage of micelles for RNA and DNA delivery but later on scientists started actively utilizing this approach for delivery of proteins and, namely, enzymes, to the brain and other organs. Scientists together with the group of enzymologists from the Lomonosov Moscow State University under the leadership of Elena Efremenko, Doctor of Biological Sciences, have chosen organophosphorus hydrolase as a one of the delivered enzymes. Organophosphorus hydrolase is capable of degrading toxic pesticides and chemical warfare agents with very high rate. However, it has disadvantages: because of its bacterial origin, an immune response is observed as a result of its delivery to an organism of mammals. Moreover, organophosphorus hydrolase is quickly removed from the body. Chemists have solved this problem with the help of a “self-assembly” approach: as a result of inclusion of organophosphorus hydrolase enzyme in a nanozyme particles the immune response becomes weaker and, on the contrary, both the storage stability of the enzyme and its lifetime after delivery to an organism considerably increase. Rat experiments have proved that such nanozyme efficiently protects organisms against lethal doses of highly toxic pesticides and even chemical warfare agents, such as VX nerve gas. Alexander Kabanov summarizes: “The simplicity of our approach is very important. You could get an organophosphorus hydrolase nanozyme by simple mixing of aqueous solutions of anenzyme and safe biocompatible polymer. This nanozyme is self-assembled due to electrostatic interaction between a protein (enzyme) and polymer”. According to the scientist’s words the simplicity and technological effectiveness of the approach along with the obtained promising results of animal experiments bring hope that this modality could be successful and in clinical use. Members of the Faculty of Chemistry of the Lomonosov Moscow State University, along with scientists from the 27th Central Research Institute of the Ministry of Defense of the Russian Federation, the Eshelman School of Pharmacy of the University of North Carolina at Chapel Hill (USA) and the University of Nebraska Medical Center (UNC) have taken part in the Project. This entry was posted in health and safety, military, nanotechnology and tagged 27th Central Research Institute of the Ministry of Defense of the Russian Federation, A simple and highly effective catalytic nanozyme scavenger for organophosphorus neurotoxins, Alexander Kabanov, Alexander V. Kabanov, antidote, chemical warfare agents, Elena Efremenko, Elena N. Efremenko, enzymes, Ilya V. Lyagin, Japan, Kazunori Kataoka, Korea, Lomonosov Moscow State University, M. V. Lomonosov Moscow State University, nanoagents, nanozymes, Natalia Klyachko, Natalia L. Klyachko, Natalia V. Zavyalova, neurotoxic organophosphorus compounds, organophosphorus hydrolase, pesticides, polymer micelles, Russia, Samyang Biopharm, Tatiana Bronich, toxic organophosphorous compounds, University of Nebraska Medical Center, University of North Carolina, US, VX nerve gas, Yuhang Jiang on April 7, 2017 by Maryse de la Giroday. A Daegu Gyeongbuk Institute of Science and Technology [Korea] research team led by Professor Su-Il In, who developed acupuncture needles combined with nanotechnology, was recognized as the world’s first application of this technology. This development is expected to open new directions in the oriental medicine research field. Professor Su-Il In’s research team from the Department of Energy Systems Engineering succeeded in developing porous acupuncture needles (hereafter PANs) that offer enhanced therapeutic properties by applying nanotechnology on the acupuncture needles for the first time in the world. The findings of this experiment, which was conducted in collaboration with DGIST’s research team and the Addiction Control Research Center at Daegu Haany University, have attracted the attention of the relevant academic field in light of the fact that the experiment combined nanotechnology with acupuncture needles. Professor In’s research team developed PANs with fine pores ranging in sizes from nanometers (nm= one billionth of a meter) to micrometers (? = one millionth of a meter) on the surface of the needles using a nano-electrochemical method. PANs are formed by anodization, and are characterized by a widened surface of the needles through the following process: anion (F-) contained in the electrolyte bored into the surface of the metal needles (positive) and created fine and uniform pores. PANs are expected to be as effective as conventional large and long needles by minimizing the sense of pain during acupuncture treatment while expanding the surface area of the needle 20 times greater than conventional acupuncture ones. Through electrophysiological experiments with rats, In’s research team proved that PANs excel in transferring signals from a spinal dorsal horn by the in vivo stimulation of Shenmen (HT7) points, and in particular, demonstrated that the efficacy of PANs is superior to conventional acupuncture needles in treating alcohol and cocaine addiction in animal experiments. Applications for international patents for the fabrication technology of PANs developed by DGIST have already been submitted in countries such as the US, China, and Europe. In addition, in the domestic oriental medicine field, the fact that the efficacy of acupuncture needles has been improved through their structural transformation by applying nanotechnology has been recognized and evaluated as the first such instance in the thousand-year history of eastern medicine. This entry was posted in medicine, nanotechnology and tagged Abdul Razzaq, acupuncture needles, Bong Hyo Lee, Chae Ha Yang, Craig A. Grimes, Daegu Gyeongbuk Institute of Science and Technology (DGIST), Daegu Haany University, Hee Young Kim, Hierarchical Micro/Nano-Porous Acupuncture Needles Offering Enhanced Therapeutic Properties, Hye Rim Kim, Jae-ha Yang, Korea, Kyeong-Seok Lee, oriental medicine, porous acupuncture needles (PANs), Su-Il In, Su-ll In, SuChan Chang, Young S. Gwak on November 11, 2016 by Maryse de la Giroday. Blood testing is the standard option for checking glucose levels, but a new technology could allow non-invasive testing via a contact lens that samples glucose levels in tears. … glucose is a good target for optical sensing, and especially for what is known as surface-enhanced Raman scattering spectroscopy [also known as surface-enhanced Raman scattering or surface-enhanced Raman spectroscopy, and SERS], said Shih, an associate professor of electrical and computer engineering whose lab, the NanoBioPhotonics Group, works on optical biosensing enabled by nanoplasmonics. This is an alternative approach, in contrast to a Raman spectroscopy-based noninvasive glucose sensor Shih developed as a Ph.D. student at the Massachusetts Institute of Technology. He holds two patents for technologies related to directly probing skin tissue using laser light to extract information about glucose concentrations. The paper describes the development of a tiny device, built from multiple layers of gold nanowires stacked on top of a gold film and produced using solvent-assisted nanotransfer printing, which optimized the use of surface-enhanced Raman scattering to take advantage of the technique’s ability to detect small molecular samples. Surface-enhanced Raman scattering – named for Indian physicist C.V. Raman [Raman scattering; SERS history begins in 1973 according to its Wikipedia entry], who discovered the effect in 1928 – uses information about how light interacts with a material to determine properties of the molecules that make up the material. The device enhances the sensing properties of the technique by creating “hot spots,” or narrow gaps within the nanostructure which intensified the Raman signal, the researchers said. Researchers created the glucose sensing contact lens to demonstrate the versatility of the technology. The contact lens concept isn’t unheard of – Google has submitted a patent for a multi-sensor contact lens, which the company says can also detect glucose levels in tears – but the researchers say this technology would also have a number of other applications. “It should be noted that glucose is present not only in the blood but also in tears, and thus accurate monitoring of the glucose level in human tears by employing a contact-lens-type sensor can be an alternative approach for noninvasive glucose monitoring,” the researchers wrote. In addition to Shih, authors on the paper include Yeon Sik Jung, Jae Won Jeong and Kwang-Min Baek, all with the Korea Advanced Institute of Science and Technology; Seung Yong Lee of the Korea Institute of Science and Technology, and Md Masud Parvez Arnob of UH. Scientists know that glucose is present in tears, but Shih said how tear glucose levels correlate with blood glucose levels hasn’t been established. The more important finding, he said, is that the structure is an effective mechanism for using surface-enhanced Raman scattering spectroscopy. Although traditional nanofabrication techniques rely on a hard substrate – usually glass or a silicon wafer – Shih said researchers wanted a flexible nanostructure, which would be more suited to wearable electronics. The layered nanoarray was produced on a hard substrate but lifted off and printed onto a soft contact, he said. This entry was posted in medicine, nanotechnology and tagged Arumugam Manikandan, blood testing, C.V. Raman, checking glucose levels, Chi-Yung Lee, Chia-Wei Chen, contact lens, glucose, gold nanowires, Guozhen Shen, Hao-Chung Kuo, Henry Medina, Jae Won Jeong, Je-Wei Chang, Jeannie Kever, Korea, Korea Advanced Institute of Science and Technology (KAIST) Seung Yong Lee, Korea Institute of Science and Technology, Kuangye Wang, Kwang-Min Baek, Md Masud Parvez Arnob, non-invasive testing via ontact lens, optical sensing, Sheng-Wen Wang, Shih-Yuan Lu, Surface-enhanced Raman scattering, Surface-enhanced Raman scattering (SERS), surface-enhanced Raman scattering spectroscopy, surface-enhanced Raman spectroscopy (SERS), Teng-Yu Su, University of Houston (UH), US, Wafer Scale Phase-Engineered 1T- and 2H-MoSe2/Mo Core–Shell 3D-Hierarchical Nanostructures toward Efficient Electrocatalytic Hydrogen Evolution Reaction by Yindong Qu, Wei-Chuan Shih, Yeon Sik Jung, Yi-Chung Wang, Yu-Chuan Shih, Yu-Lun Chueh, Zhiming M. Wang on October 28, 2016 by Maryse de la Giroday. Researchers at the University of Pennsylvania have developed the first placenta-on-a-chip that can fully model the transport of nutrients across the placental barrier. The flash-drive-sized device contains two layers of human cells that model the interface between mother and fetus. Microfluidic channels on either side of those layers allow researchers to study how molecules are transported through, or are blocked by, that interface. Like other organs-on-chips, such as ones developed to simulate lungs, intestines and eyes, the placenta-on-a-chip provides a unique capability to mimic and study the function of that human organ in ways that have not been possible using traditional tools. Research on the team’s placenta-on-a-chip is part of a nationwide effort sponsored by the March of Dimes to identify causes of preterm birth and ways to prevent it. Prematurely born babies may experience lifelong, debilitating consequences, but the underlying mechanisms of this condition are not well understood due in part to the difficulties of experimenting with intact, living human placentae. The research was led by Dan Huh, the Wilf Family Term Assistant Professor of Bioengineering in Penn’s School of Engineering and Applied Science, and Cassidy Blundell, a graduate student in the Huh lab. They collaborated with Samuel Parry, the Franklin Payne Professor of Obstetrics and Gynecology; Christos Coutifaris, the Nancy and Richard Wolfson Professor of Obstetrics and Gynecology in Penn’s Perelman School of Medicine; and Emily Su, assistant professor of obstetrics and gynecology in the Anschutz Medical School of the University of Colorado Denver. The researchers’ placenta-on-a-chip is a clear silicone device with two parallel microfluidic channels separated by a porous membrane. On one side of those pores, trophoblast cells, which are found at the placental interface with maternal blood, are grown. On the other side are endothelial cells, found on the interior of fetal blood vessels. The layers of those two cell types mimic the placental barrier, the gatekeeper between the maternal and fetal circulatory systems. In 2013, Huh and his collaborators at Seoul National University conducted a preliminary study to create a microfluidic device for culturing trophoblast cells and fetal endothelial cells. This model, however, lacked the ability to form physiological placental tissue and accurately simulate transport function of the placental barrier. “The placental cells change over the course of pregnancy,” Huh said. “During pregnancy, the placental trophoblast cells actually fuse with one another to form an interesting tissue called syncytium. The barrier also becomes thinner as the pregnancy progresses, and with our new model we’re able to reproduce this change. The Penn team validated the new model by showing glucose transfer rates across this syncytialized barrier matched those measured in perfusion studies of donated human placentae. While useful in providing this type of baseline, donated placental tissue can be problematic for doing many of the types of studies necessary for fully understanding the structure and function of the placenta, especially as it pertains to diseases and disorders. While the placenta-on-a-chip is still in the early stages of testing, researchers at Penn and beyond are already planning to use it in studies on preterm birth. As part of a $10 million grant from the March of Dimes that established the Center, Parry and his colleagues research metabolic changes that may be associated with preterm birth using in vitro placental cell lines and ex vivo placental tissue. The grant also supported their work with the Huh lab to develop new tools that could model preterm birth-associated placental dysfunction and inform such research efforts. I believe this paper is behind a paywall. One final note, I thought this was a really well written news release. This entry was posted in medicine, nanotechnology and tagged A microphysiological model of the human placental barrier, Ariana S. R. Schanzer, Cassidy Blundell, Christos Coutifaris, Dan Huh, donated placental tissue, Emily J. Su, Emily R. Tess, Emily Su, human placentae, Korea, March of Dimes, organ-on-a-chip, placenta-on-a-chip, premature babies, preterm birth, Samuel Parry, Samuel Parry. Dongeun Huh, Seoul National University, syncytialization, University of Colorado at Denver, University of Pennsylvania, US on August 5, 2016 by Maryse de la Giroday.